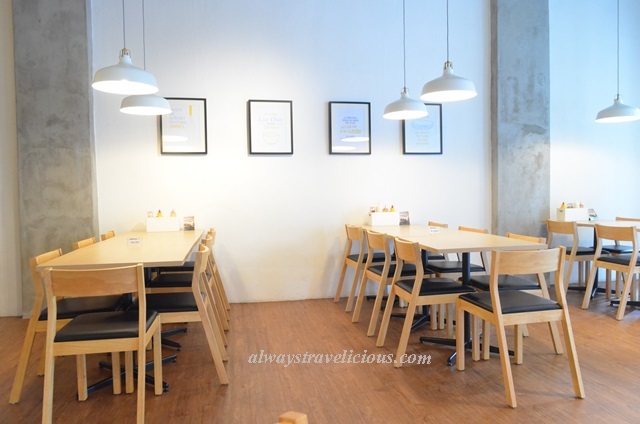 Mustard Sandwich House Cafe @ Ipoh, Malaysia - Always Travelicious ! In popping colors of yellow and blue, Mustard Sandwich House Cafe serves humorously-named sandwiches like Cowboy Hotpants, French Kiss and Smoky Virgin. Yellow has got to be an inevitable color at this cafe since it’s called “Mustard” Sandwich House Right? Chamomile tea is simple and soothing (RM 4.90). I had to stir up the layer of chocolate syrup that’s hiding at the bottom of my Cafe Mocha (RM 9), unwilling messing up the coffee art during the process. The cookie is a bit Famous-Amos-ish with a lesser crunch. I picked the the Awesome Pig Sandwich (RM 15.90) to see if it’s really that awesome; well, it’s quite alright with a pretty salad that consists of red cabbage leaves, lettuce and alfalfa drizzled with tangy vinaigrette, Doritos chips and of course the poppy-seed-studded-charcoal-bun sandwich. There are two sections to the cafe. The front section is fresh with clean-cut contours, and the motivational posters are patting you at the back, telling you “it’s all right to eat more”. 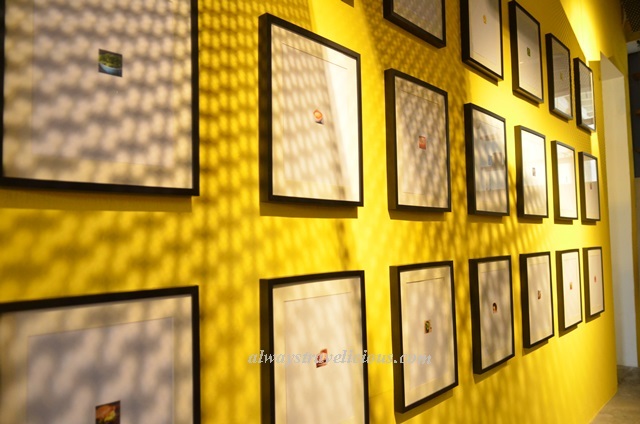 or at the coffee bar with an enormous wall full of framed coffee images. 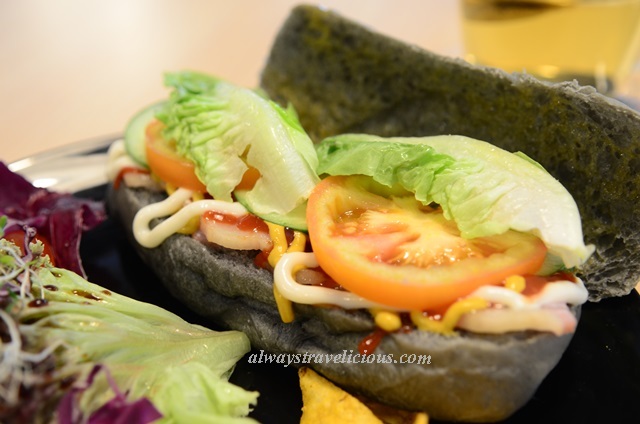 Mustard Sandwich House is located on Jalan Chung Thye Phin, on the same road as Kinta Medical Center. Looking forward to try the French Kiss Sandwich as it has a key ingredient that I am yet to savor – pig’s tongue. Address : No. 7 Jalan Chung Thye Phin, Ipoh, Perak. Opening Hours : Mon, Wed – Sun : 8 am – 3 pm. I was curious about the Awesome Pig Sandwich too but from here it didn’t look as awesome as I would have wanted it to be. Perhaps I’m being difficult but methinks they should have channeled the late Elvis Presley because I think he definitely knows a thing or two about creating an ‘awesome pig sandwich’, would you agree?! I hope I have not made the sandwich less worthy by posting a pic of chewed “bacon”… and I am not quite sure how Mr Presley would contribute to an awesome pig sandwich. lol ! Elvis Presley is the father of what must be the most awesome (heart-attack inducing, calorie-laden) pig sandwich ever and apparently, he filled his with a pound of crispy pork bacon! Unfortunately, one also has to like peanut butter and bananas with it as these are the other legendary fillings in this beast. I also heard that a slather of jelly (jam, to me) was also present. Oh my god.. that is one awesome sandwich ! I never knew this about Elvis Presley. I haven’t tried peanut butter with bananas, but peanut butter with strawberry jam is a YES for me ! Pingback: 81间怡保特色咖啡屋/Cafe攻略秘籍 - Always Travelicious ! 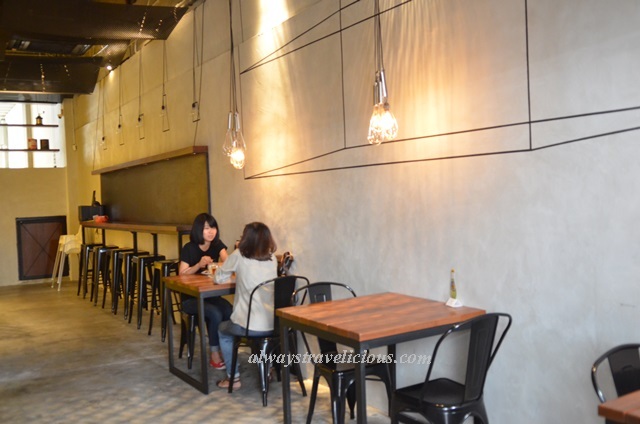 Pingback: 81 Cafes to Visit in Ipoh - Always Travelicious !